Product #2395 | SKU BEUV300 | 0.0 (no ratings yet) Thanks for your rating! Select from UNLATCH, BYPASS or LATCH modes, then twist the dedicated RISE, RATE and DEPTH dials. In Latch mode, the effect is constantly on once you step on it. Unlatch mode only applies the effect while you press down on the pedal, so you can add vibrato to a single not if you like. You’re guitar will be playing mind-games with everyone in earshot as familiar, but hardly ordinary, tones of the 1960s and ‘70s ooze out of your amp. 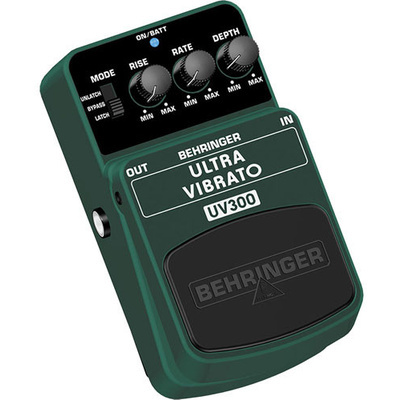 To every tone, there is a time and purpose for getting…well, a little “retro-spective.” When that mood strikes, you’ll be glad you brought along your trusty ULTRA VIBRATO UV300. Audition one at your BEHRINGER dealer.